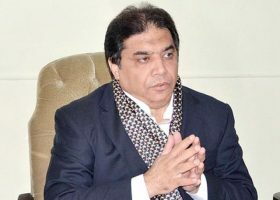 RAWALPINDI: Lahore High Court’s (LHC) Justice Mirza Waqas Rauf on Thursday excused himself from hearing the appeal of Pakistan Muslim League-Nawaz (PML-N) leader Muhammad Hanif Abbasi against the verdict of Control of Narcotics Substances (CNS) court in Ephedrine case. According to details, Hanif Abassi has challenged the verdict of the CNS court against him. On Thursday, as the hearing started, the LHC’s Rawalpindi bench member Justice Mirza Waqas Rauf excused himself from hearing the appeal while Justice Ibad-ur-Rehman Lodhi announced that now the court will hear the appeal after holidays. On July 21, the CNS court awarded life imprisonment to the PML-N aide and imposed a fine of Rs1 million as Hanif Abbasi was found guilty of selling 500kg ephedrine illegally to narcotics smugglers after recording evidence of the witnesses and final arguments by the defence and prosecution counsels. Abbasi was accused of misusing 500kg controlled chemical ephedrine which he obtained for his pharmaceutical company, Gray Pharmaceutical, in 2010. But instead of using it in medicine he allegedly sold it. The Anti-Narcotics Force (ANF) had registered a case against Abbasi and his accomplices in June 2012 under section 9-C, 14.